Domino, aka CL Soaring Free, is a handsome almost 5-year-old white-and-black male, born June 19, 2002. His sire is Greys Statesman and his dam is Heart Break Girl. 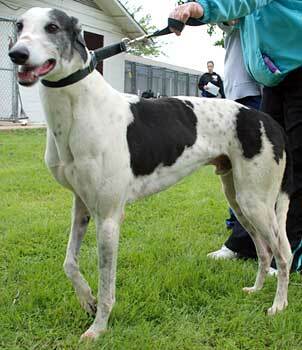 Domino is more than ready for his retirement after 194 races, starting July 28, 3005, at Corpus Christi and finishing his last race on March 1, 2007, at Valley Race Park in Harlingen. Domino arrived on Easter Sunday with the group from the close of Valley Race Park. Mr. Domino is a little too interested in kitties. If the cat is a VERY sassy one and it holds its ground hissing and growling, Domino will back off. But if the kittie is not on its guard it is just too interesting for him and he gives chase. He also will search for the cat after it has run away to a hiding place. 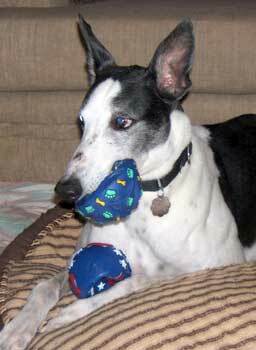 So it will be best if this sweet boy finds a forever home without kitties as he is not cat trainable. Domino is a very sweet boy and my constant shadow. He enjoys playing with the furry babies and has developed a fetish for blankets, towels, rugs, and you never know what he is going to pull out of the dirty clothes hamper. He's quite the character and is learning how to play. I don't have the heart to tell him how goofy he looks diving head first onto the doggie beds and I'm not fast enough with a camera to catch him in action yet. Domino is doing well with his housetraining; he really does try to tell me when it's time to go outside. He "sits" (sloppy as it may be) for his treats, which he dearly loves. His personality continues to show itself and he is finally coming into his own after a couple of months in a foster home. 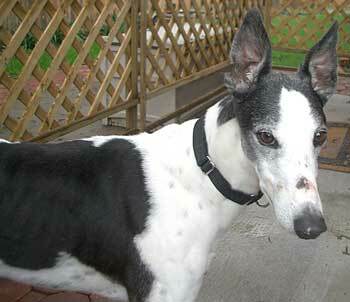 Domino is very loving and like most guys, he wants to follow you around and get his fair share of ear rubs. 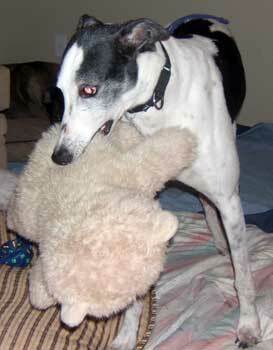 He has adopted my 20-year-old Avanti bear and carries it with him to bed every night, most often to use as a pillow. He's quite the character and could be an only dog or an addition to your existing furry family.